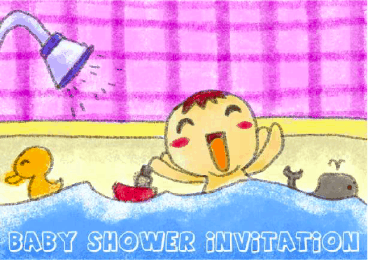 A happy baby enjoys bath toys on this printable baby shower invitation that is appropriate for either gender. The card is large (half-fold) in size. This invitation is available in two versions: a free, ready-to-use version and a $6 editable version. The free version is available in Acrobat (PDF) format: just download one, open it in Acrobat (or another program that can display the PDF file format) and print. The $6 version can be edited with Microsoft Word. It can be customized with your own personaized greeting or message. You can pay using your PayPal account or credit card. You'll be able to download the customizable invitation within moments. If you don't see a invitation design or category that you want, please take a moment to let us know what you are looking for.